Last year our church had a sermon series entitled Last Man Standing that was one of my favorites of the year and really impacted my life in 2016. My favorite in the series is the one entitled Men or Boys . I had written a post Act Like Men about this back then that is worth the few minutes to read and will give plenty of context into this post. Be on your guard, stand firm in the faith, be men of courage, be strong. Do everything in love. Be on your guard, in love. Stand firm in the faith, in love. Be men of courage, in love. A sidebar on word etymology. I love learning more about the origins of the words we use as they are often far different from how we use them today. And when ancient texts, like the Bible are translated into our modern language often words are used that have the proper meaning, but our modern interpretation of those words could be different. So I enjoy looking at where the words come from and even learning the Greek or Hebrew that the Bible was originally written in so as to better understand the original meaning. God’s Word doesn’t change and is true to what God is wanting us to hear, however our imperfect language that we use today can sometimes lead to misunderstandings or misinterpretations if you are not careful. While God will let His truth come through regardless of what language you read His Word in, it does help to understand what the writers were originally trying to convey. The sentences sound a bit strange in our modern vernacular, but when you look at the original language the word for love used in the 14th verse is, agape. Of all the different words for love used throughout the Bible, agape is used to indicate the highest form of love. Often used to indicate the love God has for us or we have for God. It is a universal, unconditional love that is there regardless of circumstances. So what is being said here in this verse? 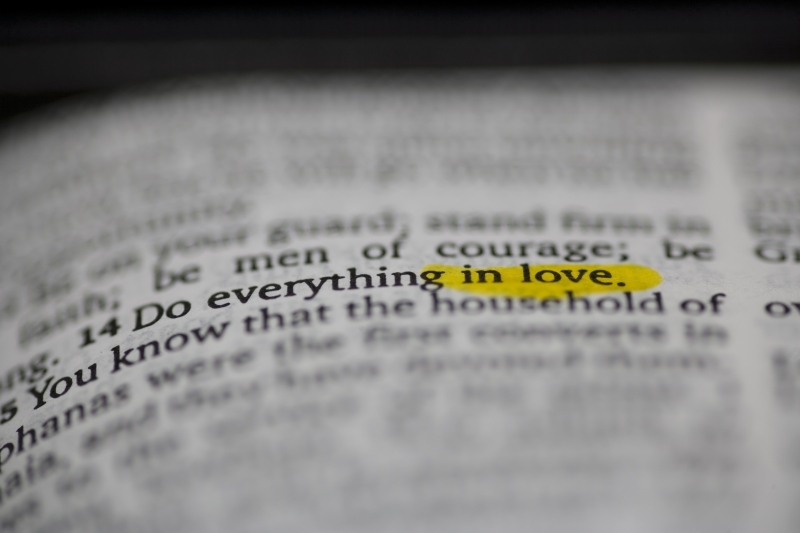 What Paul was trying to tell his readers, is everything should be done in love to God. By doing these in love, we should be like Christ. Being like Christ should be the foundation for every decision we make and every action we take. Watch against Evil: We need to watch for the evil in this world, but do so in the context of love. When we have the love of God in us and that love comes out from us, evil becomes easier to spot. With that context, we can judge our actions and the actions of others in that light. Does that activity we are about to take glorify God and show the love of Christ to those that might witness our actions? If not, be on guard. Do the words we speak to our spouse share the same love that God shares to us? If not, be on guard against those words. We should be on guard to see those opportunities that God puts in front of us every day to do good. It could be something big and in the open like being on mission over seas. It could be as small as a smile to a stranger. In fact, I believe those little things can have a big impact for God’s kingdom and they are simple easy things to do. But we need to be on guard to seize the opportunities we are given. We need to stand firm in the faith that was given to us by the Word of God. We need to persevere in the faith, for if we don’t than this is an evidence that we never had the saving faith in the first place. Judas Iscariot, for example, eventually showed that he was not a true believer. A hallmark of a Christian saving faith, is continuing till the end. Many will hate Christians, they will criticize you, they will mock you, they may even try to harm or kill you…but the perseverance in persecution will be a sure sign of salvation. Remembering the promises of God’s love will help us keep on. God’s love will never fail us and when we remember that, keeping our faith becomes so much easier. And when we stand firm in faith, showing the love of God to others, even those that oppose us, becomes natural. There is a trait that I think distinguishes a man most distinctively, the solitary foundation of manhood. And I want to sum it up in one word, it’s the word fortitude….Now I know that’s not an often used word today and that’s why I picked it. It’s not one that has a lot of baggage. It’s one that may come to you sort of from out of left field and you’re wondering what it means. Let me tell you what it means. Webster’s dictionary says, “Fortitude is that strength or firmness of mind, courage of soul which enables a person to encounter danger with coolness, to bear pain or adversity without murmuring, depression or despondency.” And then we could sum that up by saying, “Fortitude is courage built on strength of soul.” Fortitude is a good word because it combines courage with strength but it also has a third component and that is conviction. Fortitude is the combination of those three things: conviction, courage and strength. We are to have courage in our faith, we are to be strong in our faith and we are to be sure of our faith. But remember this is all to be done in love. The love is a critical part. There are many strong and courageous people that believe strongly in something, but without the love, they can just become tyrants. We as Christan’s are called to have fortitude, but to be loving as well. They know that they must have the truth, they must have unwavering conviction about the truth, they must have the courage to stand for those convictions and the strength to withstand the assault. That’s what defines a man. A man is known by his character, by his fortitude. With all these others, we are to be strong. We should put all our energy which God has provided in maintaining the truth. When we exercise this faith, we become spiritually stronger. When I physically exercise, I become physically stronger. It is no different when exercise our faith. When we do so, our faith become stronger and we are able to resist the enemy even more effectively. The word used for be strong here krataióō is which is translated to be strengthened in a passive voice. The other actions talks about previously in the verse are things we need to do, things we can take action on. This call to be strong is a willingness to all God to strengthen us. Something God does to us and for us, not something we can do for ourselves. The thing we must do is submit ourselves to Him so He can make us strong in the faith. The more we submit, the stronger God can make us. When we become strong in the faith, we are able to do the others much more effectively. So all these things Paul is admonishing us to do and we do them in love like Christ loved, they will draw us closer to Christ giving us the strength and courage to endure to the end and resist the enemy and allows us to be strong in the faith so that others can see the love of Christ in us. The love is the key part to all of these. Christ loved us even though we are sinners and gave us a pathway to God that we could never follow on our own. Through Christ we can be made strong and fearless. Through Christ we can be sure we can persevere until the end. Though Christ we can be on guard against the enemy and be watchful of those opportunities that God gives us to serve. And through Christ we can share the love that he has shared with us.